Uttarakhand BJP leaders have welcomed Congress leader and Pauri Garhwal MP Satpal Maharaj’s entry into the party. Uttarakhand Congress leaders have strongly reacted to Satpal Maharaj's exit from Congress and his act of subsequent joining of BJP. Disgruntled BJP MLA from Haridwar City, Madan Kaushik will campaign for Ramesh Pokhriyal Nishank, party candidate from the Haridwar Lok Sabha seat. Congress workers in Mussoorie are finding it difficult to come to terms with the decision of Satpal Maharaj joining BJP. The decision of Satpal Maharaj to join the BJP today has come as a rude shock for many Congress workers who are still trying to figure out the chain of political events which could have bearing on the forthcoming Lok Sabha elections. The decision of Satpal Maharaj, one of the seniormost Congress leaders of Uttarakhand and Pauri Garhwal Lok Sabha member, will have implications on the stability of the Congress-led state government of the state. However, senior BJP leaders as well as Satpal Maharaj himself have denied any attempt to destabilise the state Congress government led by Chief Minister Harish Rawat. While old Congress warhorse and Garhwal MP Satpal Maharaj's sudden exit from Congress has surprised many, those from regional parties in Uttarakhand see the development as reflection of politics of opportunism being practised by both national parties, BJP and Congress, in Uttarakhand. Reacting sharply to his ouster from the Uttarakhand Kranti Dal (UKD), AP Juyal said yesterday that the party’s national president Trivendra Singh Panwar was acting like a dictator. It was a moment that 65-year-old Gurpreet Singh, a resident of Ropar in Punjab, was waiting to see in his lifetime. A dream woven almost 25 years ago came alive when his ''darshani gilaaf'' adorned the 94-feet mast called Jhandaji during the annual Jhanda Mela organised to commemorate the birth anniversary of Guru Ram Rai here today. AIIMS (Rishikesh) Director Dr Rajkumar met the Uttarakhand Governor Aziz Qureshi to apprise him about the activities and progress of the institute at Raj Bhavan here yesterday. A blood donation and general health check up camp was organised at Mahadevi Institute of Technology in association with Rotary Club in Dehradun here today. CNI Girls Inter-College celebrated its 155th Foundation Day at the school premises here yesterday. Established in 1859, the school had been a pioneer in inculcating knowledge to children’s in all streams. An elephant died after having a tussle with another elephant inside Rajaji National Park. With less than 50 days left before the polling in Dehradun district, only 395 arms license holders have deposited their arms out of 22,000-odd arms licence holders who are sticking to their guns, literally, in violation of a rule that requires them to deposit their weapons with the police ahead of an election. The annual technical fest of Indian Institute of Technology (IIT), Roorkee, ‘Cognizance 2014’, commenced today and opened its doors for over thousands of tech enthusiasts across the world.
" Jas Deya Garhwali,” a video album comprising Garhwali music, was released in Dehradun today. Uttarakhand Governor Aziz Qureshi in a function at the Raj Bhavan, here today, felicitated Lt Priya Semwal, widow of Naik Amit Sharma who was killed in a counter insurgency operation. A seminar on AIDS and HIV awareness was organised by the Real Host in association with the Uttarakhand State Aids Control Society (USACS), which was attended by senior citizens and other dignitaries here today. A female leopard died after being trapped in a clutch wire for over 11 hours at Kakraligate village of Tanakpur sub division in Champawat district on Thursday evening. The 80-year-old elderly woman, Phool Mirza, who was shot by assailants outside her house at Mehboob Colony in Brahmanwala died after ten days in the hospital. A 40-year-old woman died on the spot when a bus hit her while overtaking another vehicle in Doiwala, here today. The bus was going to Rishikesh from Dehradun and was on a very high speed when the accident took place, according to the eyewitnesses. A drawing competition “Magic with Colours” was organised for students in Dehradun yesterday. The performance by a dance troupe on the tunes of orchestra enthralled the college students during the ongoing student week celebrations at DBS PG College here today. The college students, including girls and boys, danced along with the stage performers on famous Bollywood songs. Tel Bhawan Green defeated Tel Bhawan White by 28 runs in the finals of the ONGC inter-department cricket tournament played at BR Ambedkar stadium here today. Batting first, Tel Bhawan Green scored 80 runs with Sushil Badola made the highest 25 runs and MP Belwal 11 runs. From Tel Bhawan White, Sanjay Bhatt took 3 wickets. In reply, Tel Bhawan White got off to a bad start with batsmen getting out without scoring much runs and the whole team getting bowled out after making 52 runs. For Tel Bhawan Green, Nitin Dua and Mohammad Fahad took 3 wickets each. The three-day Inter-House Table Tennis Tournament of Ecole Globale International Girls’ School concluded here today with players in both doubles and singles categories participating with unmatched enthusiasm and vigour. Welcoming Congress leader Satpal Maharaj, Rajya Sabha MP from Uttarakhand Tarun Vijay said a person with a strong background of culture and spiritualism like Satpal Maharaj had no place in the Congress, and it was like ‘home coming’ for him in the BJP, though delayed. “Congress governments both at the Centre and in the state are a source of demoralisation. The Congress has lost all control over the party organisation and as a result the state is witnessing a painful chapter of non-governance. The Congress-led government is collapsing under its own weight and the party is witnessing an unprecedented exodus,” he said. Tarun Vijay said Satpal Maharaj’s joining the BJP will strengthen BJP in Uttarakhand as well as fuel the development works. He said that his vast experience in development works and as Union Cabinet minister will be helpful in devising new strategies for the state. BJP Garhwal convener and former MLA Mahendra Bhatt expressed happiness over Satpal Maharaj’s joining BJP today. He said Satpal Maharaj had a big following all over the country that would immensely benefit BJP. He said Maharaj understood the problems being faced by Kedarnath disaster victims and also saw the complete neglect of disaster victims at the hands of both Vijay Bahuguna and Harish Rawat governments in the state, and this prompted him to join BJP. Ajay Bhatt, Leader of the Opposition in the state Assembly, said the entire Uttarakhand BJP was upbeat at Satpal Maharaj's decision to join the BJP. He said the BJP would be extremely benefited from the development in the Lok Sabha elections. State BJP president Teerath Singh Rawat said the Congress was a sinking ship and sane people were leaving it. He said the BJP had always believed in the politics of development. He said the induction of Satpal Maharaj into the BJP would strengthen the party in the state. Another Uttarakhand BJP leader Prakash Pant said the BJP was like an ocean and all rivers finally merged into it and Satpal Maharaj is one such river. He said credible politicians across the country were joining the BJP. Haridwar:Ramesh Pokhriyal Nishank, BJP candidate from the Haridwar Lok Sabha seat, has welcomed Satpal Maharaj’s decision to quit the Congress and join the BJP. He said Maharaj’s entry into the party fold had further brightened the prospects of the BJP of winning the forthcoming parliamentary elections. Nishank, while campaigning for the forthcoming elections, said Maharaj was being neglected by the Congress for quite some time. He had requested Maharaj earlier to join the BJP. The former Chief Minister said with Maharaj coming into the party fold the BJP would be able to achieve a 5-0 victory in all parliamentary seats in the state. “Satpal Maharaj has always been closer to the BJP ideology. The Congress only used him politically but never gave him his due credit. The BJP is a party with a difference in which a seasoned politician and a man of his calibre will get the due responsibility and credit. We both belong to the same place (Pauri) and hence we know each other quite well. But sharing the party dais will surely be a cherishing moment for me,” said Nishank, who had represented the Karanprayag and Thailisain Assembly segments falling in the Pauri Lok Sabha five times. He added party candidate from Pauri Garhwal BC Khanduri would win by a record margin this time as Maharaj was no longer his rival. Meanwhile, the district party committee organised various campaign related meetings and roadshows in Nishank’s favour in Haridwar today. Various divisional unit office-bearers, municipal councillors and veteran leaders like Ram Moorti Veer attended the meetings. They urged the people to support Nishank to ensure the development of Haridwar. Maharaj quitting the Congress was the hot talk of the day with people and activists of various parties discussing the political development with equal intensity. Uttarakhand Congress leaders have strongly reacted to Satpal Maharaj's exit from Congress and his act of subsequent joining of BJP. The party has described Maharaj as opportunist and unprincipled politician. Uttarakhand Almora Congress MP Pradeep Tamta has accused Satpal Maharaj of backstabbing Congress. “Satpal Maharaj is an opportunistic politician, which he has now shown,” he said. Uttarakhand Task Force convener Yogendra Khanduri said Congress will rather get strengthened with the exit of Satpal Maharaj from the party. He said politicians like Satpal Maharaj have weakened Congress time and again. He also held that Satpal Maharaj keeps RSS mentality. Cabinet Minister Indira Hridayesh while admitting that exit of senior leader like Satpal Maharaj was certainly a setback for the Congress. She said Maharaj had certainly grievances that could not be addressed in time. She, however, asserted that Maharaj's exit will not affect the state Congress government as no MLA in the state will like to go for elections at this juncture. Another Cabinet minister Harak Singh Rawat said it was wrong on the part of Satpal Maharaj to quit the Congress, particularly when the party was facing tough times. Another minister Dinesh Agarwal said the party would not be affected by Satpal Maharaj leaving the party. Disgruntled BJP MLA from Haridwar City, Madan Kaushik will campaign for Ramesh Pokhriyal Nishank, party candidate from the Haridwar Lok Sabha seat. This was stated by BJP district in charge, Ashish Gupta, here today. Gupta tried to put an end to speculations that Kaushik may join Congress, by saying that prior to the briefing he had held a long chat at Khanna Nagar residence of the three time city legislator. "We had fruitful talk with Kaushik making it clear that all the speculations are wrong and he has been a dedicated BJP worker, so no question of switching loyalty arises. Soon, Kaushik will share the dais with party candidate and other leaders at the right time," said Gupta. Close aide of Madan Kaushik and BJP divisional president Vikas Tiwari also made it clear that there was no resentment or opposition from their side. Tiwari said as soon as election campaigning schedule was finalised, Kaushik would lead from the front. He said as Madan Kaushik was state party vice-president and one of the senior most legislators in the Assembly, one should think twice before making any comment on his loyalty towards party. “We are now motivated with joining of Pauri Garhwal MP Satpal Maharaj in our party. Now, we will work hard to ensure record margin victory for Nishank,” said Tiwari. Youth wing general secreary Rajeev Chaudhari also ushered support to Nishank's candidature, saying that fielding of all three former chief ministers has given a solid message to the public that BJP is hopeful of getting majority in the forthcoming Lok Sabha elections. Congress workers in Mussoorie are finding it difficult to come to terms with the decision of Satpal Maharaj joining BJP. The decision of Satpal Maharaj to join the BJP today has come as a rude shock for many Congress workers who are still trying to figure out the chain of political events which could have bearing on the forthcoming Lok Sabha elections. A Satpal Maharaj loyalist told The Tribune that the senior Congress leader who gave his life to the party was not treated well by senior leaders who failed to address his grievances effectively, thus leaving him with no other option but to join the BJP. Some Congress members also aired their concern that all was not well in the party organisation in the state and such activities do not augur well for the party which has to go to people during Lok sabha and panchayat elections soon. Many Congress leaders who remained glued to their TV sets the whole day also looked worried at the future of the Harish Rawat-led Congress government as around 5-6 MLAs are believed to be close to Satpal Maharaj and could tilt the power game at any moment. However, staunch Congress supporters were critical of Satpal Maharaj and called him an opportunist. Meanwhile, the BJP workers were elated at the move and the political developments of the day. The local unit vice-president Mohan Petwal said sensible leaders of the country were realising that the Congress was nothing but a sinking ship and it would be fatal for their political careers if they board it till the elections. However, political experts feel that this could start a political war among the parties and more such cases of switching sides could be witnessed before the elections. Interestingly, Amrita Rawat, wife of Satpal Maharaj, is a Cabinet minister in the Harish Rawat ministry and at least four Congress legislators from Pauri Garhwal district owe their personal allegiance to Satpal Maharaj. Although, most of his loyal legislators have denied any attempt to shift their loyalties, there is still suspense over the fate of his wife Amrita Rawat. Satpal Maharaj has said that Amrita Rawat will remain in the Congress and serve as a minister. But political observers and Congress leaders believe that it would be difficult for her to remain in Congress while her husband has joined the BJP. On the fate of Amrita Rawat, Uttarakhand Chief Minister Harish Rawat has said that the decision rests with her. It was believed that there was no danger to the Harish Rawat government till Lok Sabha polls but there could be trouble ahead if the National Democratic Alliance (NDA) forms the next Central government and Satpal Maharaj decides to pull the rug under the feet of Harish Rawat, his old time foe in Congress politics. Besides Amrita Rawat, Uttarakhand Assembly Deputy Speaker Anusuya Prasad Maikhuri, Rajinder Bhandari, Congress legislator and chairman of Progressive Democratic Front (PDF) and state Education Minister Mantri Prasad Naithani are diehard supporters of Satpal Maharaj. The state Congress government is banking on the support of seven-member legislative group of Progressive Democratic Front (PDF), a conglomerate of three Bahujan Samaj Party (BSP) members, three Independents and the lone Uttarakhand Kranti Dal (UKD) legislator. Mantri Prasad Naithani, who is convener of the PDF, said that his group will keep a watch on the political developments within Congress and then decide. It was not clear about the understanding Satpal Maharaj had with the BJP leadership regarding the fate of the state Congress government of the since the BJP would presently like to focus only on Lok Sabha polls. Satpal Maharaj was annoyed with the Congress high command on being ignored. He was unhappy for being ignored for the post of CM of the state despite the fact that Congress did well in the state Assembly elections. He did not like Harish Rawat being made a union minister in 2009 and later being placated after the Assembly polls of 2012. In the recent change of leadership, Satpal Maharaj was ignored and even his claim to get the position of president of the Uttarakhand Congress was not considered. The horticulture portfolio was also taken away from Amrita Rawat by Chief Minister Harish Rawat. Apart from all these reasons, the likely defeat in the coming Lok Sabha polls from Pauri Grahwal seat against his arch rival Maj Gen BC Khanduri (retd) of BJP was another worry for him. Satpal Maharaj had won the Pauri Garhwal seat only twice in 1996 and 2009 Lok Sabha polls. Satpal Maharaj, a spiritual guru running his “Manav Dharam” kendras all across the country and abroad, has a large following in many states, particularly Gujarat and Rajasthan. His entry into the BJP will help the saffron party expand its’ base amongst Maharaj followers. Uttarakhand Kranti Dal leader Kashi Singh Airy said both BJP and Congress were two sides of the same coin. He said the two keep their national political interests in mind and were completely neglecting Uttarakhand in the process. He said hopping sides is not new to leaders of BJP and Congress. ''Power hungry politicians both from BJP and Congress have time and again changed sides to grab power, '' Airy pointed out. Aam Admi Party leader and candidate for Tehri Lok Sabha constituency Anoop Nautiyal said the time has come for the people of Uttarakhand to choose the government that is clean and transparent. He said people of Uttarakhand today stand disillusioned and should shun both these parties and look for a better option. CPI (ML) Garhwal secretary Indresh Maikhuri said the act of Congress veteran Satpal Maharaj leaving Congress and joining BJP evidently shows that Satpal Maharaj believes in rampant opportunism. He said both BJP and Congress are only interested in capturing power and are least concerned about development of Uttarakhand. He said personal ambitions were supreme in both these parties. He said Panwar was imposing his decisions on party workers and was responsible for removing him from the post of UKDs Working President. Addressing a press conference Juyal said Panwar was misleading the party workers and taking decisions on his own without consulting anyone within the party. “Panwar has no rights to dispel me from the party, as I am working towards bringing the workers together and am creating harmony among them. The decision is totally unconstitutional,” he said. “I was neither informed about the expulsion nor asked for any clarification and it is through the media that I have come to know about my suspension. I request the party’s Supreme Rights Committee to review the decision taken by the president,” Juyal said. A tradition nearly 314 years old, the annual fair is organised at Guru Ram Rai Darbar located in the heart of the state capital on the fifth day after Holi. Crafted entirely out of a Sal tree, replaced every three years, the mast is covered with three layers of clothing comprising muslin and velvet (shanil). Gurpreet Singh had done the booking for the ''darshani gilaaf'' in the year 1990. “It was at the insistence of my father that I did the booking for the darshani gilaaf. I was blessed with a son after many years and that is why we wanted to drape the Jhanda baba. I wish my father was alive today to see the historical event. He died eight years ago,” said Gurpreet, who was accompanied by his entire family. The booking for the maroon coloured ''darshani gilaaf'' has been done till 2099. Kesar Singh, son of Bachna Ram, a resident of Ropar, did the booking on Thursday for 2099. Meanwhile, the bookings for the 51 inner covers have been completed till 2035. "The historical Jhanda Mela is held annually to mark the birth anniversary of Guru Ram Rai, which falls during Maha Panchami. In 1676, Guru Ram Rai ji came to this place from Punjab and established his settlement here. Because of his settlement here the Doon Ghats were then called Dehra Doon and now referred as Dehradun. Guru Ram Rai ji is known as the founder of Dehradun," said the head priest. Lakhs of devotees, mainly from Punjab, visited the shrine to attend the fair that begins today and would culminate on April 8. Prof Mathew Prasad, VC of the Bharsar-based Horticulture and Forestry University, also met the governor. He informed the governor about the initiative launched by the university for the welfare of farmers in the border areas of the state. Prasad told the governor that with the help of Indian Council of Agricultural Research, the university had started a scheme for the welfare of tribal farmers. In the first phase of the scheme, 24 villages of Kalsi block of Dehradun have been chosen. He said the university was developing research-based farming systems for tribal areas to enhance the income of tribal farmers. The college students associated with the college wing of the National Service Scheme (NSS) participated in the camp. Meenu Singh, chairman of the institute, appreciated the students for organising the camp and said such initiatives must be taken regularly as they benefit everyone. Dr Bhawna said over 160 students took part in the general health check up and 67 unit of blood was collected during the blood donation camp. Addressing students on the occasion, Vineeta Martin, school Principal, said the school had been providing education to children belonging to every section of the society. She said the school alumni had also achieved success in their life after studying from the school. Apart from education, school students have excelled in extra-curricular activities such as NCC, scouts and guides and sports, she added. According to park sources, a tusker aged about 35 years was found dead in the Gohri range of the park. “A fight between two tuskers took place at Gohri range of the park, which resulted in the death of one of the tuskers,” disclosed Rajaji Park Director SP Subudhi. The deceased tusker had sustained injuries on its stomach and head and died from the injuries. Even the police have failed to step up the process of depositing the licensed arms despite the District Magistrate's orders regarding it a fortnight ago. It seems the district police are still waiting for license holders to deposit their arms, including single and double-barrel guns, pistols and revolvers, voluntarily. While speaking to The Tribune, Senior Superintendent of Police (SSP) Ajay Rautela accepted that there are approximately 22,000 licensed guns in the district, of which just a few hundreds have been deposited by the licence holders till date. ''The remaining licence holders need to turn up with their weapons soon though each police station will be directed to approach the gun owners in their jurisdictional areas for asking them to deposit the arms as early as possible,'' said SSP. Reportedly, the Election Commission had issued a notification for licensed guns to be handed over to the police as soon as the election dates were announced. Accordingly, the District Election Officer (DEO) directed the police to start the process of collecting the firearms immediately. According to the police, the licensed gun holders are supposed to deposit their arms in the police station of their area or with the firearm shops and deposit the receipt slips in the police station. Generally, in case the licence holder does not turn up within the stipulated time, the police team goes to the gun owners' houses and collects the arms and deposits these in the police station. More than 60 per cent of licence holders are high-profile businessmen. Real estate dealers and local politicians own revolvers or pistols, a source said. ''The private guards deployed in banks and ATMs could be given exemption as they have a convincing reason to hold them,'' said Ajay Rautela, SSP, Dehradun. Even certain individuals might be given exemption under special circumstances from depositing the firearms, based on a written request mentioning the reason. The first day of the Asia’s largest technological festival had challenging competitions, including lectures by noted luminaries, varied workshops and fun-filled activities like Armageddon, Power Drift, Aeronave etc. Over 20,000 engineering and management students from several institutes across the country had registered for the three-day gala affair. There are events customised for entrepreneurs, technologists, programmers and scientists. Career talks by institutions like Wipro, SAP Universities will also constitute an integral part of the event, where students will get immersed with the knowledge that was imparted to them. The participants displayed their expertise in various fields through a series of technically challenging activities and business simulation games. During the day, online activities such as Cogni Street, Illushun, Insomnia and Blogomani also witnessed enthusiasm. "Jas Deya Garhwali,” a video album comprising Garhwali music, was released in Dehradun today. Releasing the video album prepared under the banner of Shri Films, former Narendra Nagar MLA Om Gopal Rawat said the video album will help in promotion of Garhwali as a dialect. He called upon the people to come forward towards patronising Garhwali dialect. Director Arvind Negi said the video album has songs that have been shot in sylvan surroundings of Bageshwar, Chamoli and Gwaldum. 27-year-old Semwal created history by becoming the first widow of a non-commissioned officer to join the Army after training at Chennai based Officers Training Academy. Semwal has a seven-year-old daughter Khwaish. 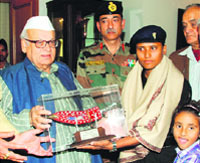 Semwal’s husband Naik Amit Sharma, of the 14-Rajput regiment, was killed while taking part in a counter-insurgency operation in Arunachal Pradesh. Congratulating the newly commission Lieutenant for displaying courage and will power in the face of difficult conditions, Qureshi said she was a brave woman who had chosen the Army despite losing her husband in a counter-insurgency operation. He said Semwal had become a source of inspiration for women by taking this step. Those who were present on the occasion MLA Ganesh Joshi, Brig S Sabharwal, Lt Gen (retd) HB Kala and Lt Gen (Retd) OP Kaushik along with several others. The speakers talked about the lack of awareness among people regarding preventive measures against AIDS and HIV. Sanjay Singh, coordinator of the programme, and HIV counsellor Pushpa Prakash informed the people that around 5,786 cases of HIV/AIDS had been registered in the state. He said the AIDS patients needed psychological help and counselling to be able to manage their lives. He also discussed the course of treatment and management for AIDS patients. Resource person Ram Govind Bhatt said the people should take precautions while donating and accepting blood. He said the AIDS did not spread by interacting with patients. They said there were 35 million AIDS patients worldwide and the disease could only be controlled by taking preventive measures, destroying used syringes and avoiding unsafe blood transfusions. The leopardess was trapped in a clutch wire and could not be rescued from the trap because the tranquiliser team of the Forest Department could not reach the spot on time despite being informed immediately. Villagers informed the forest officers who reached the spot and called the tranquiliser team from Haldwani. The animal died before the forest team reached the spot. “The body of the animal has been burnt after the post mortem and an investigation to search the culprits who laid the trap, has been ordered,” said Pankaj Kumar, forest officer. She was shot on March 12 outside her house when she opened the gate of her house. Reportedly, the assailants came to kill the victim’s property dealer son, Imran, who was not at home and fired on Phool Mirza, critically injuring her. She was admitted to the Himalayan Hospital and was undergoing treatment since then. It is to be noted that on Thursday, Dehradun police arrested two persons, who were allegedly involved in the crime and killing property dealer Dharampal. The victim has been identified as Manju Rawat, resident of Bhaniyawala, who was walking by the roadside when the bus hit her.The police have impounded the bus though the bus driver fled the scene. Around 150 students from various schools attended the event, which was divided into five categories covering the age group of 4 years to 14 years. Students from St Nursery School, Brightlands, St Josephs Academy, Ann Mary, Riverdale and Summer Valley participated. Kulina Shah, associate professor B Arch, at Graphic Era University judged the contest. Even college dance groups performed various dance forms amidst loud cheering by their colleagues in the college premises, electrifying the college environment. Various other events were also organised on the occasion with a large number of students turning up and participating in those events. It is to be noted that a Hasya Kavi Sammelan, Rangoli and poster painting competition have already been organised during the students' week celebrations. In the women finals, Queen Eleven defeated Bhumi Challengers by 9 wickets. After winning the toss and electing to bat first, Bhumi Challengers made 66 runs at the loss of 2 wickets. Deepa scored unbeaten 17 runs and Shweta made 18 runs for Bhumi Challengers. In reply, the Queen Eleven team easily chased down the target in 8th over with Monika scored the highest 36 not out whereas Archana Bist scored 19 runs. In the doubles finals, the Aer House team of Megha Rathi and Mohini Chhotra defeated the Terra House team comprising Rhea Jemimah Thyagaraj and Gunisha Arora 2-1. In the singles, Mohini Chhotra defeated Gunisha Arora (2-1) and Rhea Jemimah Thyagaraj beat Megha Rathi (2-1).